You can use it to filter your water — This is not the most effective way to filter your water but it’s better than nothing. For this purpose, try using a cheesecloth with the finest weave possible. You can use it to protect yourself against insects — Fold the cheesecloth in half and place it on your face or ears. This should work well in swamps. You can use it to protect your jerky — During emergency situations, a cheesecloth can be used to keep flies off jerkies. You can use it as a gauze — Cheesecloth looks and feels like medical gauze and can be used as an alternative to cover open wounds. Use them as an emergency bandage. You can use it as a sling — Use the cloth as a makeshift sling. Cheesecloth can also be used to tie off splints. You can use it to fish — Use cut saplings or broken branches as bases. Tie a cheesecloth to them, leaving just enough to scoop fish or create a net. If you can, try attaching bobbers or weights to drag the net. 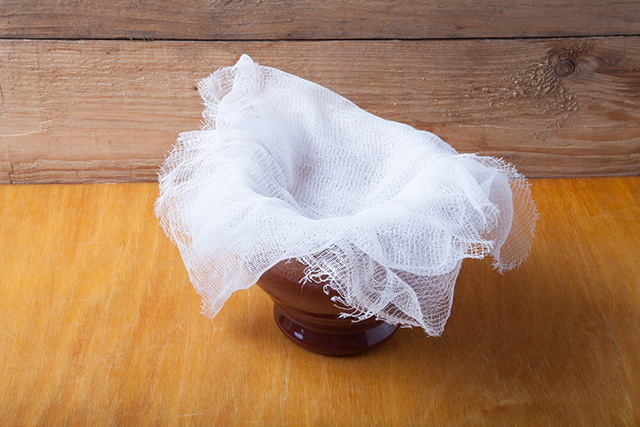 You can use it as a mask — If you find yourself in a dirty environment, using a cheesecloth can help filter out dust and dirt from entering your mouth or nose. They can also prevent cold air from damaging your face. We suggest experimenting with several weaves to see which one is the most comfortable for you. Remember that finer weaves may not offer enough space for breathing. Asthmatic patients or those with breathing problems may want to try coarser cheesecloth varieties. You can use it as an abrasive — Cut a small portion of the cloth and fill this with sand. Tie it off with string or any sort of cord (you can also cut another strip of cheesecloth and use that as string). You now have a polishing ball that you can use to clean blades, smooth out finishes on arrow tips, or scrub eating utensils. Choose a cheesecloth variety that is fine enough to contain the sand yet coarse enough to allow the sand to make contact with the other surface. You can use it as a window screen — This is self-explanatory. Weave cheesecloth into cut strips of plastic to make a decent curtain. You can use it to reinforce broken books — This may not be an emergency situation, but it’s such a wonderful use of cheesecloth that we couldn’t help but include it here on this list. Mix equal parts flour and water until it becomes a paste. Dip a piece of cheesecloth into the mixture and then cover the book’s binding with this. Let the cloth dry. It’s not the most permanent of solutions but it can keep books from falling apart. Cheesecloth is meant to make cheese by helping remove the liquid from curds. Cheese is more portable than milk and can last longer before spoiling. Try this simple recipe. Bring the milk to a boil. Add the lemon juice, while stirring. Fold a cheesecloth three times and then place this into a bowl. Pour the formed curds from the milk over the cheesecloth to strain them. Sprinkle the herbs and salt into the leftover mixture. Twist the cheesecloth into a tight ball until all the excess liquid is drained. Tie this off and let it dry. You can read more prepping and survival articles like this at Preparedness.news.